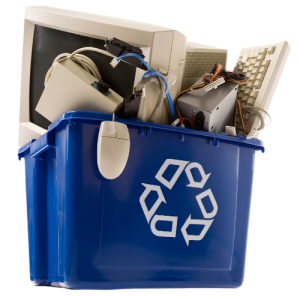 The Lake County Computer hobbyist group offers Free recycling to the residents and businesses of Lake, Cuyahoga, Ashtabula and Geauga counties. Don’t pay someone to take your items or throw them into the garbage to be never used again, give them a second life! 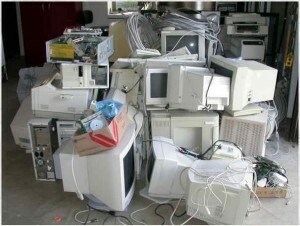 Many people don't know that old and outdated computer equipment is a health hazard, most waste removal companies won't even let you dispose of computer related items and with current strict laws, most county waste departments Do Not want them in their landfills. 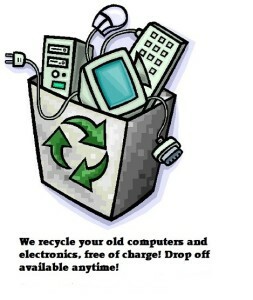 Lake County Computer will dispose of your old computers and electronic items at NO Cost to you or your business. >>Nearly 90% of what we throw away could potentially be recovered through reuse, recycling or composting. 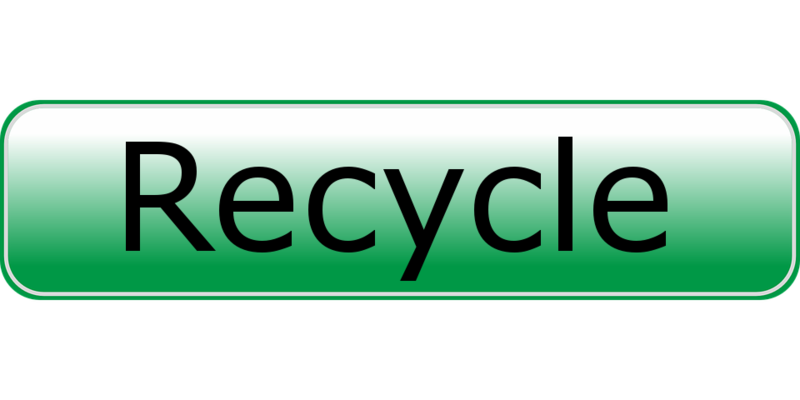 >>More Americans recycle than vote. >> The EPA admits all landfill liners will eventually leak and their toxic leachgate, or garbage juice, can seep into and contaminate soil and groundwater supplies. Roughly 20% of the sites on the Superfund list (the nation’s most hazardous sites) are solid waste landfills. 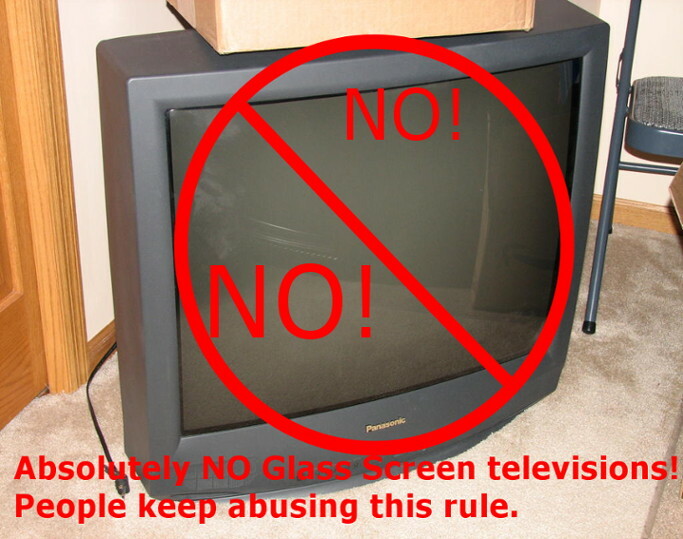 Absolutely No glass screen televisions, People have been abusing this rule and have cost us hundreds of dollars. Cameras have been installed to catch future abusers. Monitors -No limit on lcd, led, plasma flat panels type)***Due to excessive and repeated abuse, we can NO longer accept any CRT/Tube type monitors*** -a.k.a. the Older, heavy, glass screen type***Sorry! ***..all other types are fine..a.k.a. flat panel/flat screen) Scroll down for details. 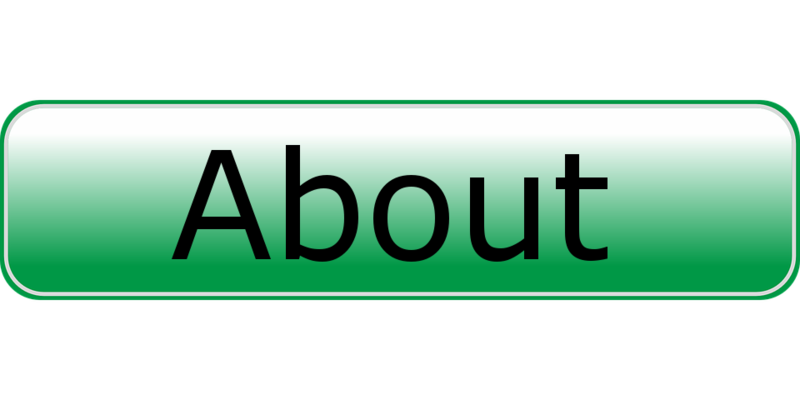 Industrial equipment such as motors, welders, CNC, lathes and other Misc. tools. ABSOLUTELY No CRT (Glass screen / tube televisions /Projection) Tube televisions/ Tube monitors as shown below in this photo. Please recycle paper and cardboard through curbside recycling and chemicals and batteries at county/city sponsored toxic cleanup days. 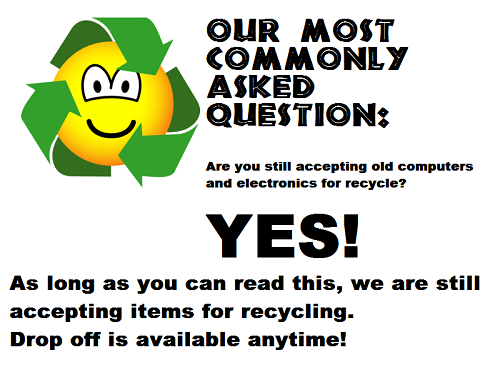 NO electronics in wood cabinets; No Furniture (we do take solid metal bed frames), No Garbage! Computer manuals and books are fine, we can recycle them. Drop offs are available 7 days a week 7 am to 9 pm. 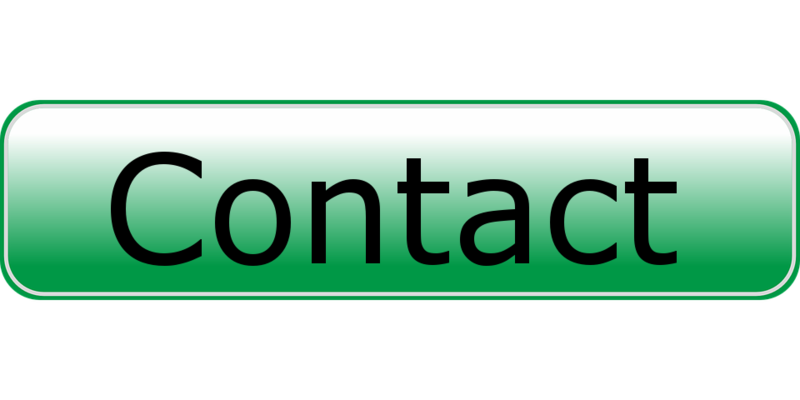 (It is NOT necessary to call ahead or e-mail before dropping off items – Feel free to leave items in near garage door or on the side sidewalk for collection) Look for the LCC sticker on the garage. 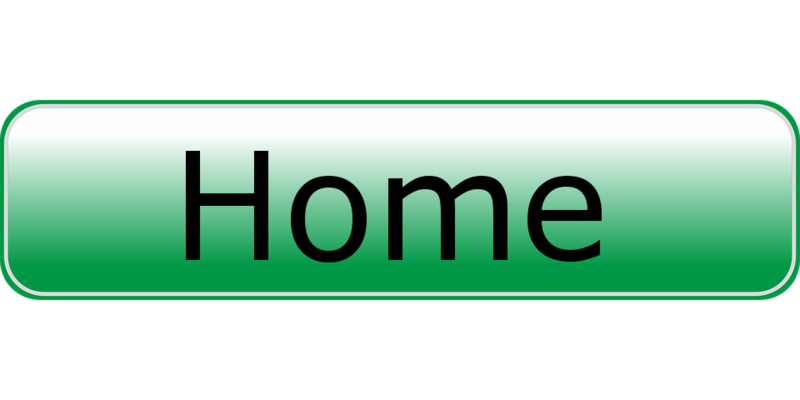 This is a residential drop off location, but there is ample space for accommodating most items. All usable items are refurbished and donated to local organizations and individuals for charity, not sold. During 2015-2019, over 40 computers were assembled from donated items and were given to random people who could not afford to buy a computer on their own. Not all donated equipment is usable, therefore we save what is usable and build computers when we gather enough to assemble a complete system. This effort is done on spare time. Thank You to all those who have recycled.